All roads this Sallah break leads to TerraKulture arena, Victoria Island, Lagos to witness one of the best works of Literature veteran, Prof. Wole Soyinka- ‘Death and the King’s Horseman’ performed live on stage. 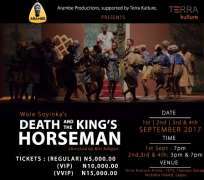 The play ‘Death and the King’s Horseman’ which is set in ancient Oyo town describes Nigeria during the Second World War, when Nigeria was still a British colony where after the King’s death, the king’s horseman commences the traditional ritual that will ensure the smooth transition of the dead king to the world beyond as the British colonial officer intervenes. As an effect, the harmonious co-existence between the living, the dead and the unborn is under severe threat, leading to a grave conflict. The presentation of the classic play according to the organisers- Arambe Productions and Mahogany International, will be the toast of town for both dignitaries and regular people as it has been scheduled to run from 1st of September to 4th of September 2017. The stage play will see stars such as Toyin Oshinaike, Tunji Sotimirin, Bukky Ogunnote, Tunde Onikoyi, Wale Lampejo and many more thrill the audience to a show of thrills and ambience as it will be directed by ace stage director, Bisi Adigun.